The Junkers Ju87 Stuka quickly became one of the most infamous, and feared weapons of the Second World War. The two-man dive bomber first saw action in the skies over Spain during the Spanish Civil War. While outdated in appearance the Stuka did contain some modern features such as automatic dive brakes but overall the design was outmoded. Over the skies of Poland, France and the Low Countries in 1940 the Stuka was able to operate in clear skies and did so effectively but over the South of England during the Battle of Britain, the Stuka came up against staunch RAF fighter opposition, and suffered as a result. Later the Stuka was used in the Balkans and the Western Desert, and continued to serve Russia, as a tank destroyer, until the end of the Second World War. 1/72 Scale. This kit Academy features fully engraved panel lines and rivet detail, detailed two-seater cockpit interior, Detailed fixed landing gear, Two cannon guns in underwing pods, Two canopy styles to choose from: one-piece or sectioned and Authentic decals. Skill level 2. 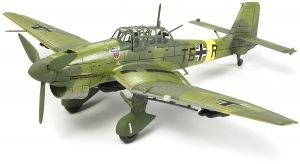 This 1/72 scale MRC/Academy plastic model kit is an authentic replica of the JU-87 STUKA. The STUKA (Dive Bomber) flew for the first time in 1935, and entered production in 1937. It was designed with large trousered landing gear and fully equipment for dive bombing. During WWII in Poland, the low countries, France, Greece, and parts of the Russian front the JU-87 was terribly effective. But, during the battle of britain the slow STUKA with its fixed landing gear was slaughtered by allied fighters and was withdrawn to attack targets which were not heavily defended. In 1942~45 its main work was close support in the Russian front where it was an exceptional tank killer. The JU-87G-1 version carried two 37mm flack cannons in under-wing pods. Throughout the war, STUKA production was repeatedly ordered to end, only to be restarted since there were very few aircraft so specialized to take its place. Academy’s kit has fully engraved panel lines and rivet details, highly detailed cockpit and fixed landing gear, two clear canopy configurations and two 37mm flak cannons. Painting and decals enable the modeler to complete the pane as flow by the most decorated Luftwaffe pilot of WWII, Hans-Ulrich Rudel. One of the most feared weapons used by the Luftwaffe in World War II was the Ju-87 dive bomber. In its early campaigns, it was highly effective, deadly and without comparable opponent in these theatres of war. Not until the Battle of Britain was the uncamouflaged Stuka shot down in great numbers. Its later successes were only achieved on the Russian front. Model details: Structurally detailed surfaces; Detailed cockpit; 2 seats; Movable propeller; Detailed landing gear; 3 bombs; 2 auxiliary tanks; and Decals for 2 Luftwaffe versions. Paint colors needed: Flat Anthracite, Flat Light Olive, Aluminum, Flat White, Flat Leather Brown, Steel, Flat Rust, Flat Tank Grey, Flat Ochre Brown, Flat Yellow, Flat Bronze Green, Flat Olive Grey, Flat Light Green, and Flat Grey. Iconic inverted gull wing Luftwaffe dive bomber, ‘Gustav’ variant optimized for anti-tank missions and fit with streamlined canopy, shallow radiator fairings and 37mm underwing cannon. Kit features fine engraved panel lines, fuselage with integral cockpit and gunner’s station, separately molded pilot seat, single-piece wing and belly, spatted undercarriage, single-piece 3-blade propeller with separate spinner assembly, cannon pods (x2). Detailed 1/72 scale model kit of the Junkers Ju-87 Stuka, a legendary World War II dive-bomber of the German Luftwaffe. The screaming sound it made during a dive bombing run struck fear in all who have been on the receiving end of a Stuka attack. Effective as it was as a ground attack aircraft, the Stuka proved to be extremely vulnerable to attack by fighters. By the “Battle of Britain” in 1940, the Stuka design was considered outdated, but without a suitable replacement, the Luftwaffe continued to produce the aging dive bomber until the end of World War II. This 1/72 scale model kit depicts the Ju-87B, which was the first mass produced Stuka variant, and the kit comes with parts to build both the B-2 (include one 250kg bomb and four 50kg bombs to depict fully loaded B-2) or the R-2 (include fuel tank parts to depict longer range R-2 maritime attack variant). German Luftwaffe Junkers Ju87G-2 Stuka Ground Attack Aircraft, 10. (Pz)/SG1, Ukraine 1944. Can be displayed sitting on its landing gear or in flight position on a raised stand in the pictures. FOR ANYONE NOT FAMILIAR WITH HOW TO INTERPRET A MODEL’S SCALE, THE MODEL IS 5 3/4 INCHES LONG WITH AN 8 INCH WINGSPAN. THESE ARE EQUIVALENT TO DIVIDING THE LENGTH AND WINGSPAN OF THE REAL AIRCRAFT IN INCHES BY 72. Italeri brand 1/72 Scale Ju-87 B2/R2 StukaPlastic Model Kit by Italeri. Suitable for Ages 14 & Up. FEATURES: Highly detailed plastic pieces molded in greyIncludes clear pieces for added realistic detailIncludes alternate assembly options on several piecesWaterslide decalsIllustrated instructionsMARKINGOPTIONS: One decal sheet with markings for 4 versions: 1) Ju 87 B-2-6/StG2-Libya, January 19422) Ju-87 R2-2/St. G.3, Crete, May 19413) Ju-87 B2-7/St. G.77, France, August 19404) Ju-87 R2-Regia Aeronautica, 208 Sq.